Bonsai (盆栽, “plant tray”) is a Japanese art form using trees grown in containers. Similar practices exist in other cultures, including the Chinese tradition of penzai or penjing from which the art originated, and the miniature living landscapes of Vietnamese hòn non bộ. The Japanese tradition dates back over a thousand years. 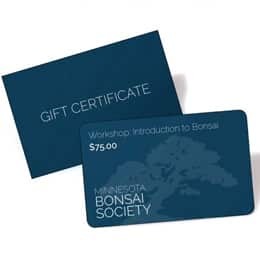 JOIN THE MINNESOTA BONSAI SOCIETY! Memberships includes full access to our website, DVD’s, library, meetings and eligibility to attend all master workshops and events. A one year membership is just $40.00. Become a member today! Memberships include an full access to our website, DVD’s, library, meetings. Plus discounts to attend member only workshops and events. A one year membership for up to 2 members of a household is just $40.00. Each participant will receive a pre-bonsai tree, a suitable pot with soil, and an intensive one-day workshop designed to give you the basic skills needed to create and care for your own bonsai. Includes a 1 year free membership! STAY UP TO DATE WITH MEETINGS AND WORKSHOPS. There are three meetings available to members of all skill levels each month. * Attendance is voluntary; pick and choose the meetings of interest to you, no sign-up required.